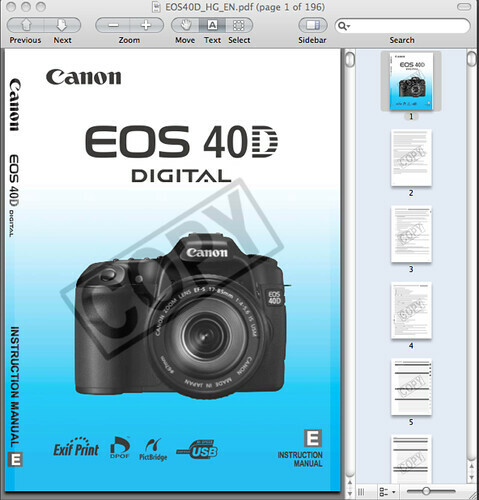 The English Language Canon 40D user manual / operating instructions (Canon calls it the “EOS 40D Instruction Manual”) is now online and available for download at Canon.com (right-click and save the user guide to your hard drive). If the download link didn’t work for you, go to the Brochures & Manuals download section for the 40D and manually locate the file EOS 40D Instruction Manual / EOS40D_HG_EN.pdf. Unlike with Nikon, Canon allows you to freely print the 40D owner’s handbook without building in any password protection into the PDF. There is a watermark displayed on each page though. The file size of 196-page Canon 40D Adobe Acrobat PDF document is 5.43 MB (megabytes). The guide discusses the features of the 40D and how to use the camera. It also describes the use of, and camera settings for several optional accessories. One example is found on Page 97: Connecting the Remote Switch. 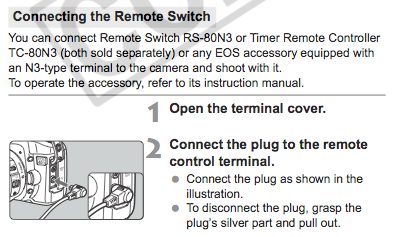 The manual explains how to connect a Remote Switch RS-80N3 or Timer Remote Controller TC-80N3 to the 40D. Examples of compatible third party remote accessories for the 40D are the Phottix Cleon C8, a wireless RF (radio frequency) remote shutter release, Phottix Nikos, Phottix Cleon II and Phottix Plato. Canon 40D — Main page.